Understanding your business – we will work collaboratively to understand your organisation and use the language that fits with your culture. Worried about organisational capacity – we offer programmes and workshops that can be both online and face to face minimising the time away from the desk. Programmes – one size doesn’t fit all – we aim to create programmes or workshops to suit your business needs, that are the right size to meet your organisational budget and timeframes. 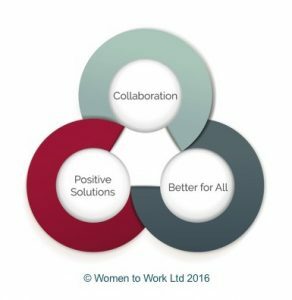 Please get in touch to discuss how Women to Work may be able to support you.